I have had these, and I love them! And, I think I can modify one of my gingermen like you did. Thanks reminding me of a good recipe. YUM.. Happy St. Nicholas Day to you, too. That's what I wrote about today, too. 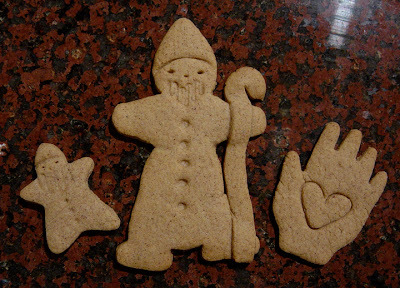 Saint Nicolas didn't find the time to bake speculaus this year. So he brought us chocolates instead. Thank you for the recipe! We lived in Germany for 6 years and St Nikolaus Day was a very nice intro to the German customs. I'll be making these cookies!